Bubble Struggle 2, 2 player games, Play Bubble Struggle 2 Game at twoplayer-game.com. 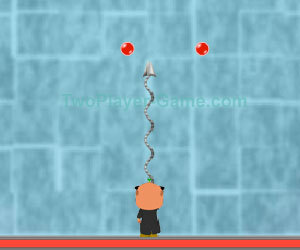 Bubble Struggle 2 Flash Game. In Bubble Struggle II, one plays as a devil character dressed in a trench coat, yellow T-shirt and bright orange shorts. Bubble Struggle 2 is characterized by colorful backgrounds that are different for every level and a simple, light-hearted game design. The object of the game is to destroy dangerous bubbles, that bounce around the screen, by splitting them into smaller components and finally destroying them altogether. Use mouse and arrow keys to play this games.